The Galactic Republic - Head Developer Opportunity! I’m representing the ROBLOX group “The Galactic Republic”. 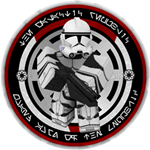 A Star Wars themed group that is dedicated to providing a rich roleplay experience! We are looking for an experienced and skilled scripter with a good track record of completing tasks on time to fulfil the role of HEAD DEVELOPER and assist completing an RP city project, you’ll need to hire other developers to the team and make sure deadlines are met whilst also completing work yourself. Ex-clan developers are very much welcome. We’re aiming for a user of the age 16 and above, and preferably users who have had experience with working with similar communities. Currently, we have up to 450K in reserved group funds and can offer % as daily pending sits at around 10-20k. Im above the age of 16, and although im not a scripter, I do have experience managing a team, and being a team member. I am also a builder, so if you need any building done I could do that. If the fact im not a scripter isnt an issue, id be more than happy to become the lead developer for this project, and I know a good set of people who would help to make this a reality.